Activation of a sensory receptor results in an action potential, which propagates through fibres of the respective nerve, to the central nervous system (CNS) where it reaches the appropriate relay neurone and is transmitted along an ascending pathway, to reach the cerebral cortex or the cerebellum. In this article we shall consider the different ascending pathways in the nervous system, and the functions and properties of each. Somatic senses are perceived consciously (with the exception of some forms of proproiception), so the information must reach the highest level of the brain – ie. the cerebral cortex. Anterolateral system (ALS): (spinothalamic, spinoreticular and spinotectal tracts). Relays information relating to pain, temperature, crude touch and pressure. Spinocerebellar pathways: (posterior spinocerebellar, anterior spinocerebellar, rostral spinocerebellar, cuneocerebellar). Primarily relay information relating to unconscious proprioception. Most of the ascending pathways consist of three neurones (a first order neurone, second order neurone, and third order neurone). The tracts often decussate from one side of the CNS to the other, meaning that the sensory information is sent to the contralateral side of the brain. We shall now consider each of the pathways in more detail. Pain (nociception), temperature, crude touch and pressure sensations. The cell body lies in the dorsal root ganglion (DRG), and the axon transmits information to the dorsal horn of the spinal cord where the neurone synapses. 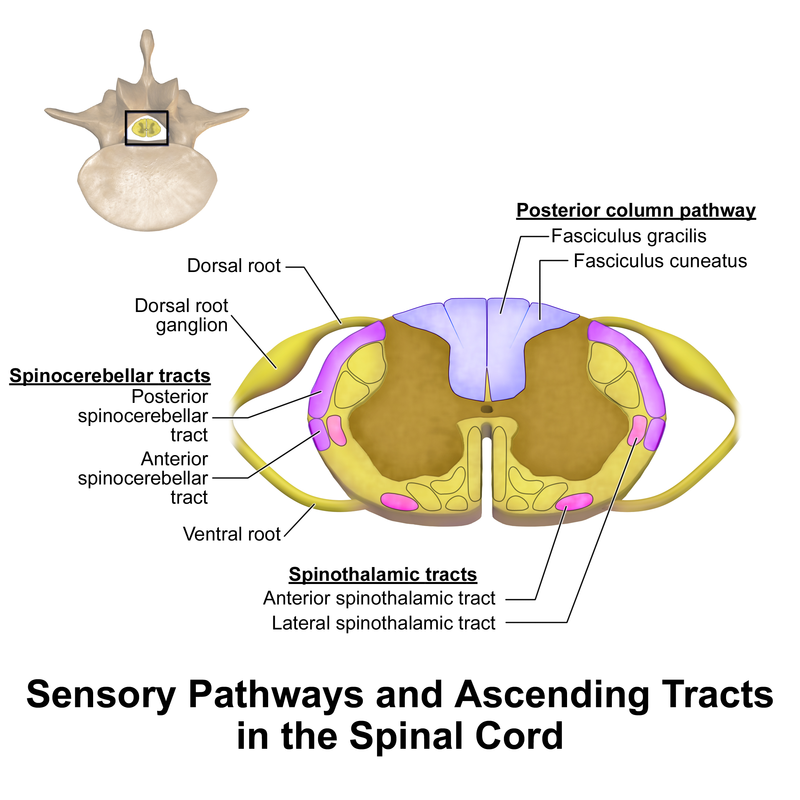 The cell body lies in the dorsal horn of the spinal cord. Its axon decussates at the level of the deramtome and then ascends on the contralateral side. In the spinoreticular tract, an indirect pathway, it synapses in the reticular formation with a few collaterals sent to the thalamus. It is responsible for arousal (waking state) and affective, or emotional, aspects of somatosensory cortex. The cell body is located in the thalamus and the axon extends into the ipsilateral somatosensory cortex, where it terminates. The pathway receives information from Meissiner’s and Pacinian corpuscles, Ruffini endings, Merkel’s discs and Golgi tendon organs, and also consists of three neurones:. The cell body lies in the dorsal root ganglion (DRG) and the axon ascends on the ipsilateral side of the cord in the dorsal horn. Input from the lower limb and trunk (below T6) ascend as the fasciculus gracilis, terminating in the gracile nucleus in the medulla oblongata. Information from the upper limb and trunk (above T6) ascend as the fasciculus cuneatus, terminating in the cuneate nucleus in the medulla oblongata. The cell bodies lie in the gracile/cuneate nucleus. 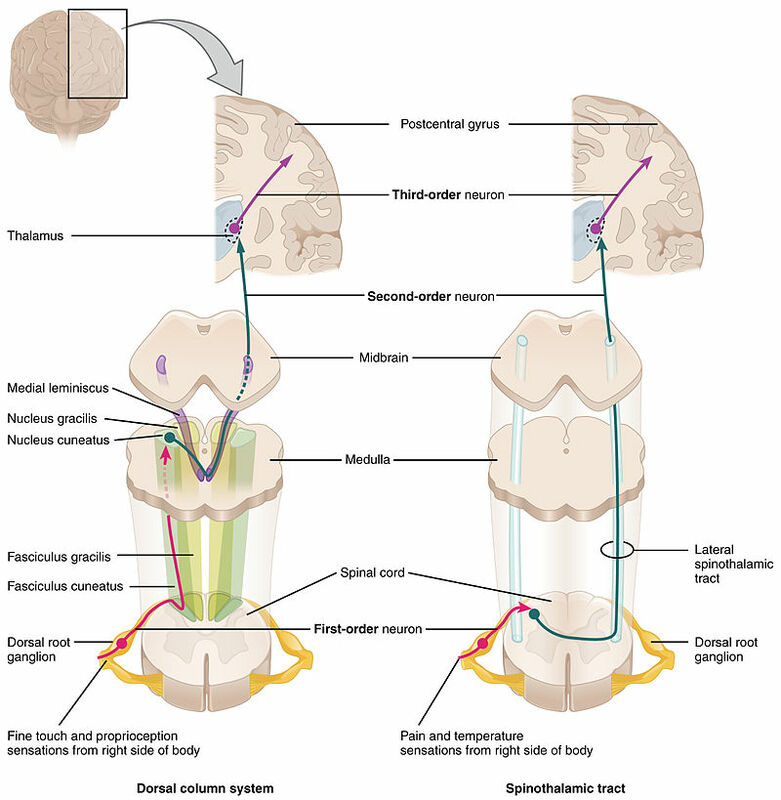 The fibres decussate to the contralateral side at the great sensory decussation in the medulla oblongata, and then ascend and terminate at the thalamus. The cell body lies in the thalamus, and the fibres project to the somatosensory cortex. 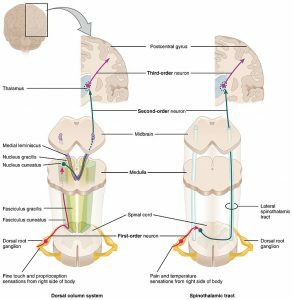 The anterior & posterior spinocerebellar tracts and the cuneate cerebellar tracts provide information on non-conscious proprioception relating to the lower limb and trunk and the upper limb and trunk respectively. 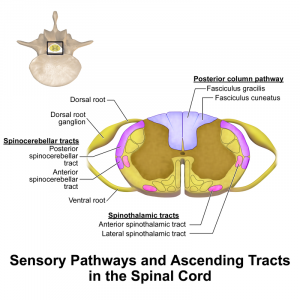 Both pathways receive information from neuromuscular spindles and Golgi tendon organs. They are uncrossed and thus report information from the ipsilateral side of the body to the cerebellum. These pathways consist of just two neurones. The spinocerebellar tract neurones synapse in the nucleus dorsalis of Clarke and ascend in Clarke’s column; the cuneocerebellar neurones synapse in the accessory cuneate nucleus. These both terminate at the cerebellum. It is a rare occurrence for damage to the spinal cord to exist in a distinct tract or quadrant, however, Brown-Séquard syndrome demonstrates a hemisection (only right or left is severed) of the spinal cord and its result. – Severing of the ALS results in contralateral loss of pain, temperature, crude touch and pressure sensation a few segments below the level of damage to the spinal cord. – Severing of the DCML pathway results in ipsilateral loss of fine touch and vibration a few segments below the level of damage to the spinal cord. Disturbance of this pathway can be seen in multiple sclerosis, in which progressive demyelination results in sensory ataxia. Without sensory input relating to the proprioception, the orientation of the body, awareness of limbs, execution of movement can be severely impaired. Such is the ‘stamp and stick’ gait of sensory ataxia. A test for the function of the posterior pathway is demonstrated as Romberg’s sign– where the patient stands with feet together, and closes their eyes- swaying will be observed, as they are unable to do this.